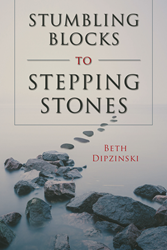 Recent release “Stumbling Blocks to Stepping Stones” from Page Publishing author Beth Dipzinski is about discovering that what people say to themselves governs the way they feel and act. In helping them become aware of their thinking and identifying thoughts that are inaccurate, they will choose different actions, which will result in a more positive lifestyle. Beth Dipzinski, the founder of Stepping Stones Crisis Management, who has extensive experience and training in the fields of assertiveness training, substance abuse, co-dependency, financial budgeting, counseling, and positive choices, has completed her new book “Stumbling Blocks to Stepping Stones”: an inspiring, instructional work to help the reader find true happiness and success by stopping the cycle of inaccurate thoughts. Published by New York City-based Page Publishing, Beth Dipzinski’s self-explorative work helps the reader to unlock their best self by focusing on their inner dialogue and self-esteem. Over the years Dipzinski has developed seminars for training clients in applying control mechanisms for stress, anger and depression, as well as techniques for building self-esteem, setting goals and improving relationships with others. This book brings her teachings to a wider audience and anyone looking to improve on their enjoyment of life and level of success would benefit from this work. Readers who wish to experience this gripping work can purchase “Stumbling Blocks to Stepping Stones” at bookstores everywhere, or online at the Apple iTunes store, Amazon, Kobo, Google Play or Barnes and Noble.